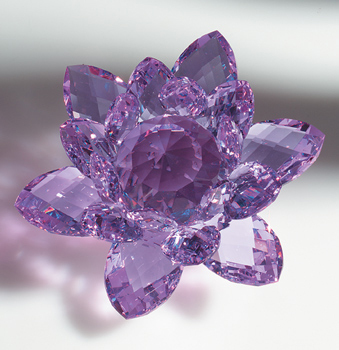 Home > Crystal Peddler > Other > Crystal Lotus - Purple 3"
Crystal Purple (Alexandrite) Lotus - 3"
L3PU - Beautiful crystal lotus in Alexandrite/Purple 3" changes color in different light. Under florescents it is a lighter blue, in the sunshine, incandescent or full spectrum it changes to bright lavender purple. This is purple glass through and through. Crystal Peddler has a $75 minimum.